← Why have I never known the Joy of cooking Black Beans in Sherry before?? C is in charge of weekend breakfasts. THANK GOODNESS he is good at it – nay, he excels at breakfast. He makes terrific omelets and even better buttermilk pancakes. They’re so good that one of R’s favorite words is PANCAKE! She storms around the house demanding PAN-CAKES! 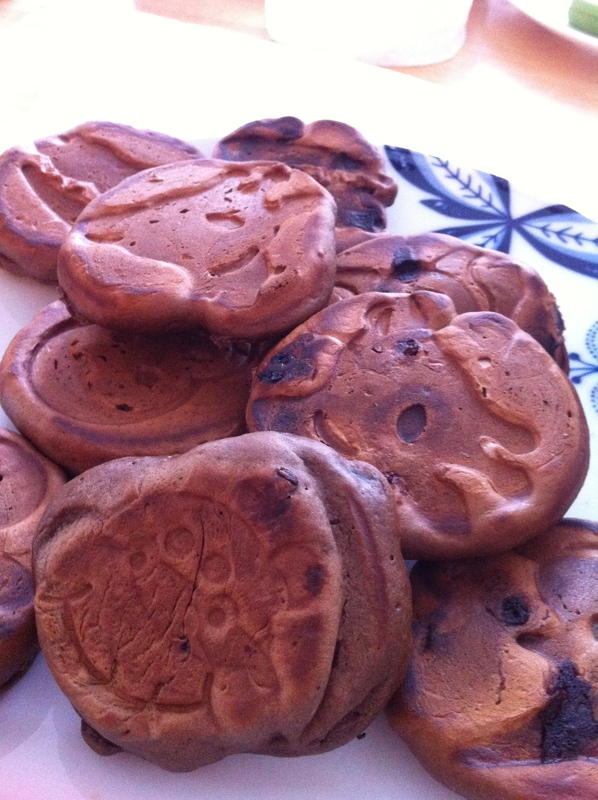 PAN-CAAAKES!! It’s hard not to laugh at her. Um, I mean with her. Can you see the fun animal shapes in the pancakes? We got a fun griddle as a gift. YAY! 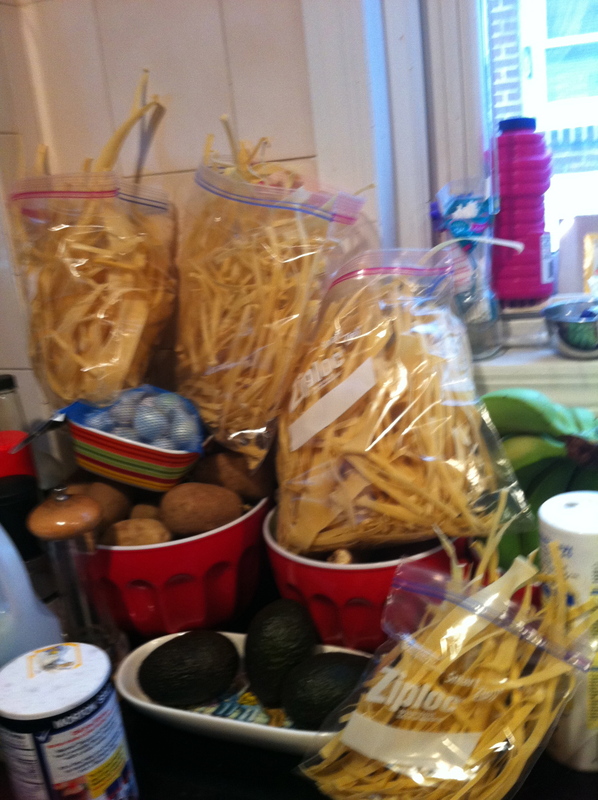 Since I’ve made a lot of homemade pasta lately I won’t bore you with those photos again. Instead, I’ll show you the appetizers I made: Granola-crusted Pecans and Baked Feta with Honey, Carmelised Apple, and Toasted Pecans. THANK GOODNESS I don’t have go weigh in to WW today. These two recipes were SOOOOOOO good that C asked me to make the pecans again for Thanksgiving and we’ve started brainstorming places to get better quality Feta – which led to whole conversations about how that would affect the next time I make this app. Can you hear the joy in my voice?? OH! OH! Don’t let me forget! I also made my first all-from-scratch pie yesterday! I’ve had a stash of frozen blueberries from the summer in the freezer and, frankly, I’m sick of them taking up freezer space. Allrecipes.com to the rescue! 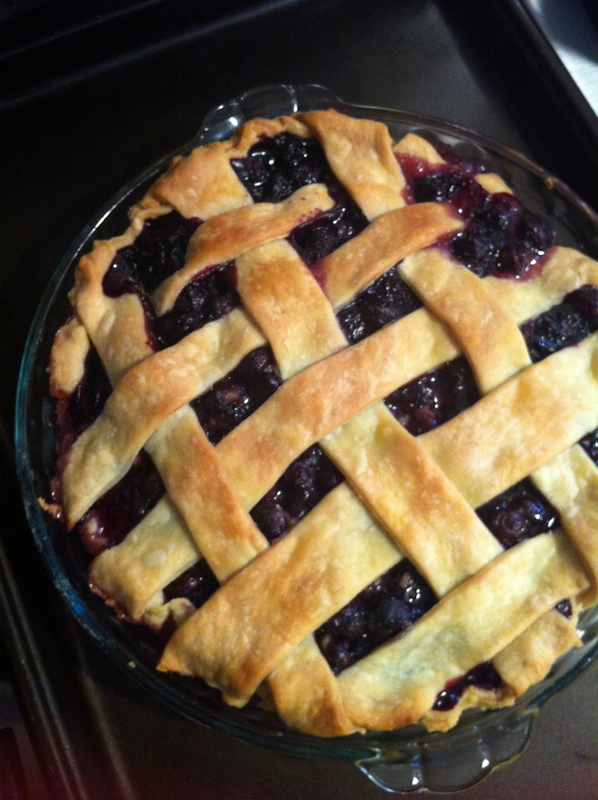 I looked up blueberry pie and found this recipe. As per the comments, I upped the cornstarch from 3T to 5T. PERFECT! 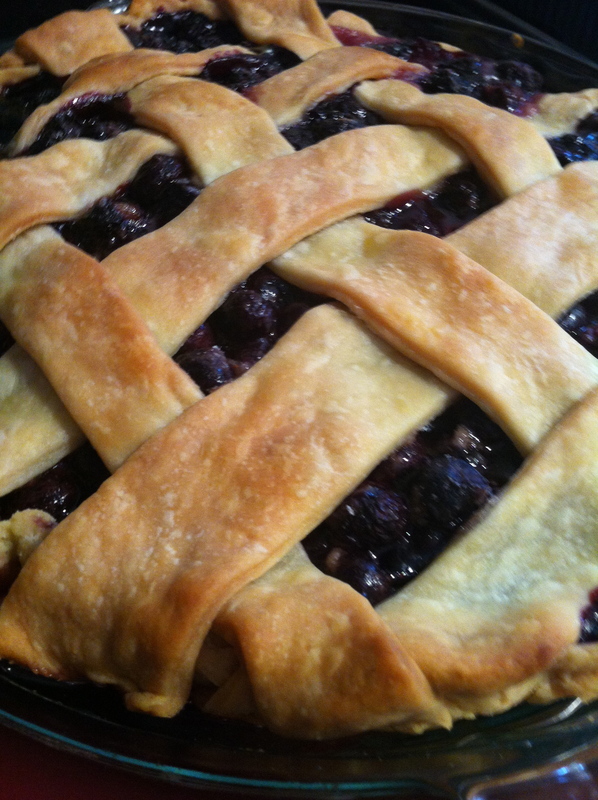 I used this recipe for the pie crust, as per another comment. 1 1/4 cup low fat buttermilk **We’ve been using powdered buttermilk, though C thinks it’s not as good as the liquid stuff. 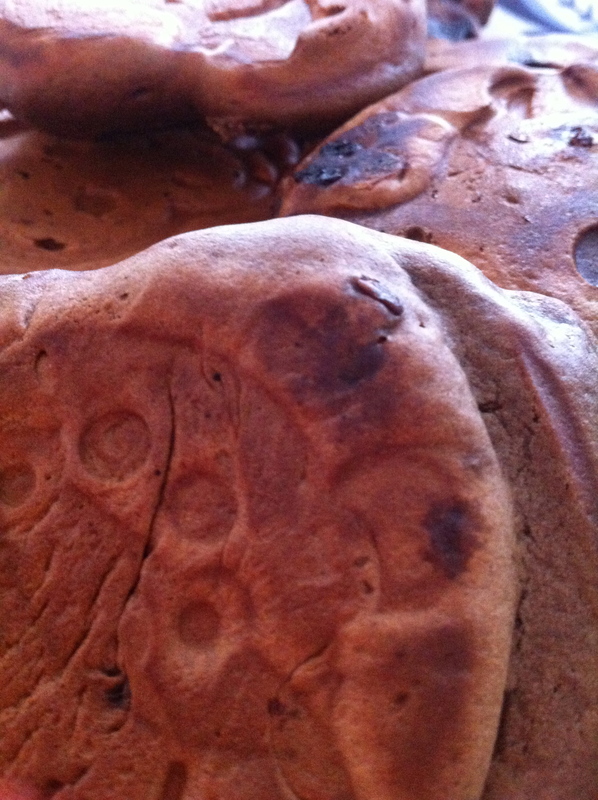 **C added a handful of chocolate chips to the 2d batch of pancakes. These totally elevated good pancakes to SWOON worthy pancakes! 1- Mix buttermilk, sugar, egg, oil and vanilla together in a bowl. 2- Add dry ingredients and mix until everything is incorporated – batter will appear slightly lumpy and will get a little foamy. **This is where you’d add those glorious little bits of joy known as CHOCOLATE CHIPS. 3- Place about 1/3 cup full onto an oiled griddle/frying pan, and cook on medium high until bubbles begin to form throughout the batter (about 5-7 minutes). 4- Flip the pancake over gently and allow to cook for another 5-7 minutes or until cooked through. A bowl full of nutty joy! 1- Preheat oven to 300 degrees. Line a baking sheet with parchment paper. 2- In a food processor, pulse oats, coconut, pepitas, sugar, cinnamon and salt in short bursts until the mixture is very well chopped but not powdery — it needn’t be like a flour. 3- In a large bowl, beat egg white and water until frothy (but not stiff). 4- Add nuts to bowl and coat them very well, using a few more stirs than will seem necessary because if the egg doesn’t get into the craters of the nuts, no granola will stick there. 5- Pour oat mixture into bowl and very gently fold it together with the nuts, so that it just barely sticks. (If you stir it a lot, the mixture just starts falling off, so just a few folds will do.) You’ll have more granola coating than will seem necessary, but this is fine. 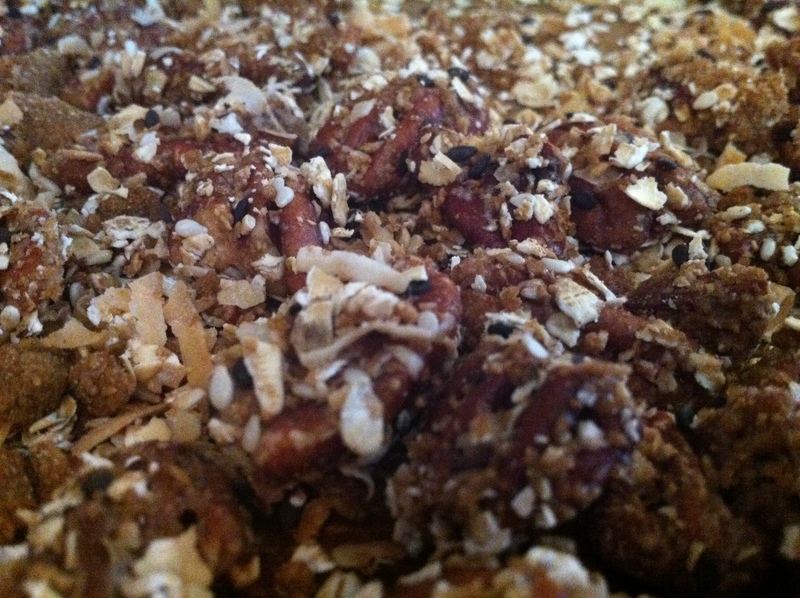 Spread nuts-and-granola out on baking sheet in a single layer but no need to separate them. 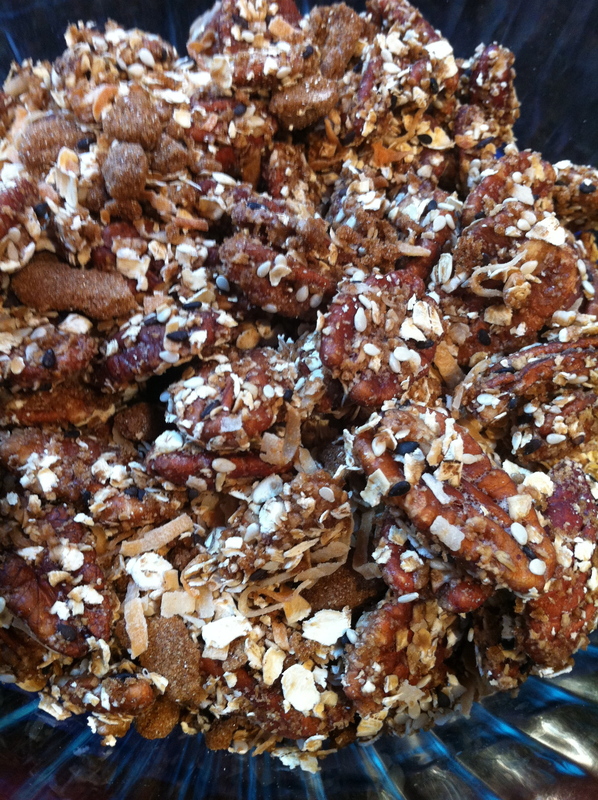 Sprinkle any granola mix leftover in the bowl over the nuts. 6- Bake for 20 minutes, moving nuts around just once in the baking time so that the inner nuts get as toasty as the ones at the edge. 7- Transfer pan to cooling rack and let nuts cool completely there. Once full cool, break up any nut clusters. This totally counts as fruit, right? Baked Feta with Honey, Carmelised Apple, and Toasted Pecans from How Sweet It Is. **I thought I’d taken photos of the feta on the table….Nope. My mistake. Apologies! 2 (8-ounce) blocks of feta cheese **I used 1/2 a super-block of feta that I got from BJs. Really, I think this recipe would be just fine with 1 block. 1 large pear, very thinly sliced **I loathe pears. I subbed in a granny smith apple. 1/4 cup pecans, chopped **I forgot to chop them until after they were already heating in the pan. I took a small bowl and just smashed them gently in the pan. No need to get the chopper all dirty! 2- Heat a large skillet over medium-low heat and add butter. 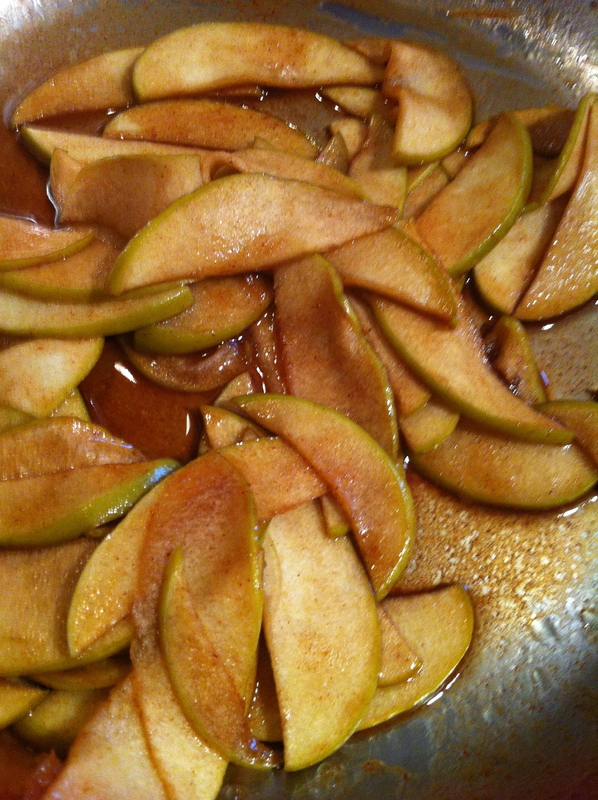 Stir in apple slices, salt, cinnamon and brown sugar, tossing well to coat. Cook for 8-10 minutes until pears are super caramely and soft. In a separate small skillet, add pecans and toast over low heat for about 5 minutes, just until fragrant. Set aside. 3- Cut both blocks of feta in half and place in a baking dish or pie plate. Brush with olive oil. Bake for 10 minutes **I let it bake for about 20 minutes so the cheese got a little gooey and soft. 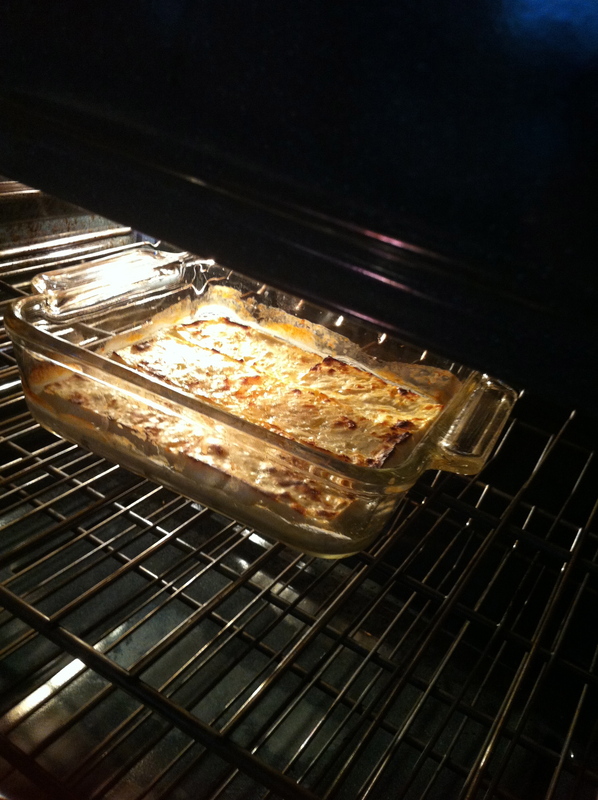 Turn your oven to broil and broil on high for 3-4 minutes, checking after 1-2 minutes. Once the cheese is golden and bubbly on top, remove it. **It took me closer to 7 minutes to get the feta all browned and bubbly on top. 4- Cover the feta with the fruit (and any sauce/juice in the pan), the pecans and the honey. Serve immediately with pita chips, crackers, fruit or vegetables. **We found this rather salty when it was hot. 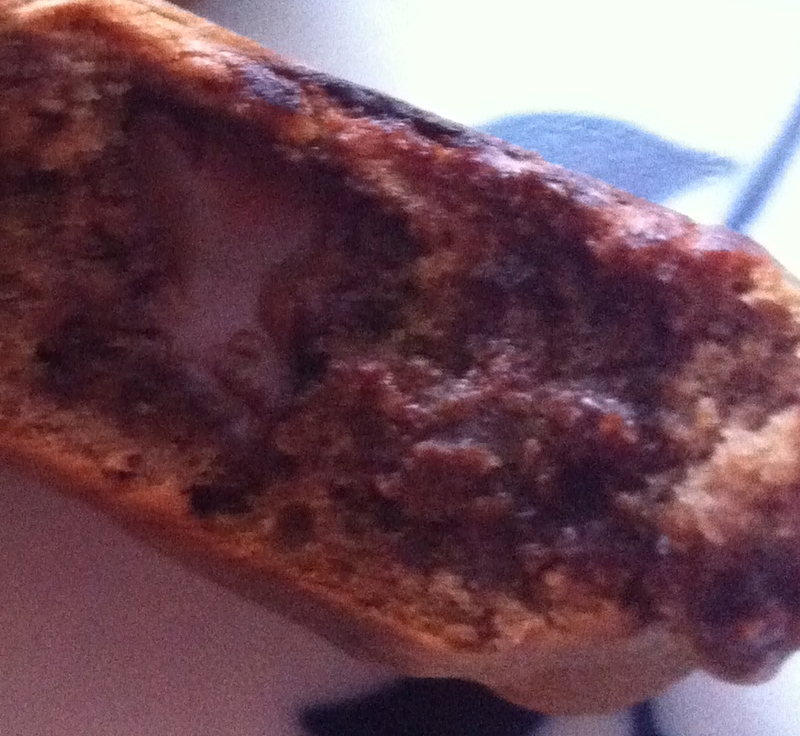 As it cooled it not only firmed up, but tasted far less salty. Yay! Basic Flaky Pie Crust from Allrecipes.com **This is for a single pie crust. Simply double to make 2. 3 Tablespoons ice water, plus more to bring dough together. This time I needed close to 6T of extra water, added 1 drop at a time, in order to bring the dough together. 1- Whisk the flour and salt together in a medium size bowl. With a pastry blender, cut in the cold shortening until the mixture resembles coarse crumbs. Drizzle 2 to 3 tablespoons ice water over flour. Toss mixture with a fork to moisten, adding more water a few drops at a time until the dough comes together. 2- Gently gather dough particles together into a ball. Wrap in plastic wrap, and chill for at least 30 minutes before rolling. 3- Roll out dough, and put in a pie plate. Fill with desired filling and bake. **I blind baked/pre-baked the crust so it wouldn’t get soggy. 4 cups fresh blueberries **I used 2 containers of frozen blueberries. I think it was about 4 cups. 1 recipe pastry for a 9 inch double crust **I used this recipe, as a commenter suggested. AWESOME! 1- Preheat oven to 425 degrees F (220 degrees C). 2- Mix sugar, cornstarch, salt, and cinnamon, and sprinkle over blueberries. 3- Line pie dish with one pie crust. Blind bake the crust (This means bake the pie crust on it’s own first so it won’t get all soggy from the berries) for 10-12 minutes, until it starts to turn golden, but doesn’t go all the way. If you have beans or pie-weights, use them. I should have…. 5- Bake pie on lower shelf of oven for about 50 minutes, or until crust is golden brown. **About 15 minutes into the baking, cover the edges with tin foil so they don’t burn.